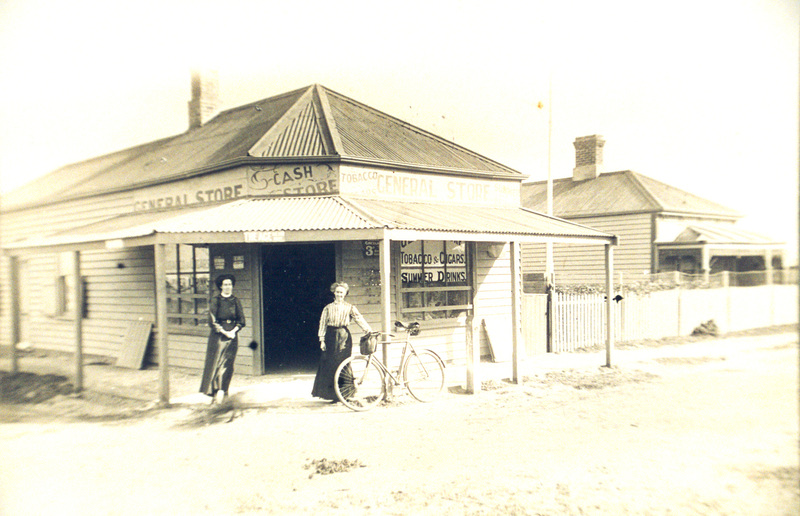 This beautiful photograph is obviously historic – in fact it’s more than 100 years old and shows the Foyster girls outside the Ocean Grove Corner Store c.1906. There is no doubt that this is part of Ocean Grove’s history and was featured in the Ocean Grove History Murals. Back in December 1975 Bob Irving took a series of overlapping photographs along the north and south sides of The Terrace between Hodgson Street and Presidents Avenue. Is this history? Not only was this history but it was an amazing legacy left for the people of Ocean Grove. Bob was a journalist and photographer (with his own dark-room) and as editor of the Geelong Advertiser he took the opportunity in his editorial once a year to give a retrospective of Ocean Grove. In 1977 he produced the RBI Album of Ocean Grove which has already been covered in detail in an earlier blog. The 1975 photos of The Terrace haunted me every time I went ‘up the main street’. I was continually trying to place the houses and shops in Bob’s collection with was was there ‘now’. Finally it got the better of me and I realised I needed to follow in Bob’s footsteps and do overlapping photographs along the north and south sides of The Terrace. That was easier said than done! In 2005 there was a lot more traffic in The Terrace than there was 30 years earlier. Early in the morning there were still too many cars and delivery vans, apart from the light not being conducive to good images. There was only one solution! Christmas Day 2005 – photographed the north side in the morning and the south side in the afternoon. Only four cars managed to get into my images! I then spent a LONG time confirming the location of the shops, houses and vacant land, then working through rate books and directories to identify what was in each location in 1975, 2005 and the years in between. All of that has been compiled into a Video – Ocean Grove: The Terrace in December 1975. There are two more videos for you to enjoy – The Terrace North Side and The Terrace South Side. Bob Irving – this would have been lost to history without his foresight to capture the 1975 images. Martin Klabbers from Barwon Heads who spent an unbelievable number of hours meticulously stitching together Bob’s and my photographs and producing an amazing pair of images that have to be seen to be believed. Fussy – Graham Fussen, my brother – who turned Martin’s amazing compositions into two beautiful moving images spanning the Terrace between Hodgson Street and Presidents Avenue. A whole-hearted thanks to Bob, Martin and Fussy. Ocean Grove: The Terrace in December 1975. Aren’t they wonderful? And of course – they ARE history. And for those still a little curious, I’ve done a quick check using Google Street View – I’ve ignored cafes / restaurants which have new names and styles. These are the buildings that have the same use in 2017 as they did in 2005. NOTE: The original allotments in Ocean Grove were generally divided into three allotments as more shops and businesses filled The Terrace, hence the ‘same’ street number for multiple shops. These are usually identified as a, b or c or Shop 1, 2 or 3 at that address. Previous Do you know when it began? The north side seems to have changed more than the south. I think your film strips showing the Terrace 30 years apart is brilliant. I am glad there were some cars left in the 2005 photos because they help to give a sense of time. The other thing that dates a shopping street seems to be the fonts on the street signs. Hi Anne – I think that was because the Corner Store / General Store was on the south side which is also the beach side. The south side was where the 3rd and 4th Post Offices were and I think that combination accounts for the extra development on the south side. Also the houses on the north side tended to have a good view of the ocean so possibly held on to them a bit longer, resisting development. The Terrace is now one way, west to east. It used to be two way and I THINK it may also have been one way in the opposite direction – would need to check other images in between. It was a magic project to work on! Hi Jackie – thanks so much for your enthusiastic comment about the blog AND about Ocean Grove. There are more details on the locations of Ocean Grove’s Post Offices on my web site … http://zades.com.au/gandd/index.php/geelong/research/gdpostof Hope that helps jog the memory. I’ve not spent a long time in Ocean Grove, but loved it when I was there visiting my daughter and family many years ago. I would love to return and wander around that area and Queenscliff as we did then. A beautiful area..
Hi Chris – Thank You! I’ve been following the all, Susie.. it truly is a lovely area, steeped in history. I do hope we get to revisit.